By any standards Tom Hanlon was a phenomenal athlete. Starting with the Euro Junior Championships in 1985, he became a Scottish and British Internationalist, Olympic athlete, European Championships athlete, World Championship athlete twice, twice a Commonwealth Games representative plus World cross-country runner as a junior and a GB road runner. Domestically ten gold medals for the E-G (almost all turning in the fastest time on the stage), plus silver and bronze, top ranked Briton in the steeplechase six times and multi-Scottish track champion with the steeplechase record set in August 1991 in Monaco. And yet with a career spanning almost 20 years he is not as well known as many other international athletes. He really should be and I’ll try to cover his career here although it might appear as a serial. There is just so much to cover – and it may be the case that the high points can be recognised for what they are if they appear gradually and don’t overwhelm by their quantity. Let’s start with his place in the Scottish All-Time Rankings. There should have been another one there – he was undoubtedly good enough to run faster over the classic mile distance. I actually saw him and timed him inside the magic four minutes for the race. There was a Scottish Select competing in Birmingham at Birchfield Harriers Stadium against Midland Counties and Birchfield. Tom made no secret of his intention to run a sub four so there were three Scottish watches that I knew of plus one held by an English coach and fellow BMC member. He went straight to the front and ran slightly inside the 60 seconds a lap required and crossed well clear of Rob Harrison, GB Internationalist and Birchfield Harrier. The time keeping was manual and he was given a time fractionally outside 4 minutes. All of the ‘unofficial but experienced’ timekeepers got the same time to the tenth of a second. The English coach with the watch said what the Scots did not: “If it had been Rob in front he’d have been given under 4 minutes.” Not too many sub fours are solo runs. Although he was best known as a track runner Tom was so talented that he would have been world class in any aspect of endurance running that he chose so before looking at his wonderful record as a steeplechaser I would like to have a look at his career over the country and on the roads. 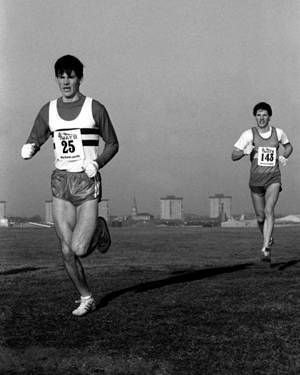 Born on 20th May 1967, he first appears in the National Cross Country results as a Junior Boy (Under 13) in February 1981 running for Edinburgh Southern Harriers and finishing fifth. A year later as a Senior Boy (U15), he was twenty fourth before winning his first championship on 26th February 1983 as a Senior Boy. As a Youth (Under 17) he was third in 1984 and second in 1985 and his first years as a Junior (Under 20) were the same – third and second. He didn’t run the National often as a Senior Man but he did win it in 1991 Running for Racing Club by 33 seconds from Irish Internationalist and fellow steeplechaser Peter McColgan of Dundee Hawkhill Harriers. There were two runs in the IAAF World Junior Cross Country Championships – in 1985 and 1986. The 1985 selection caused some controversy – the selectors had omitted Cambuslang’s Eddie Stewart from the team to go to Lisbon when he had finished seventh in the national and instead took finishers one to six and number eight (Colin Hume of ESH) and had also omitted Pat Morris of Cambuslang from the Junior team and preferred Hanlon who was still a Youth. Cambuslang called for a special general meeting of the SCCU but to no avail, the selections stood. This sort of controversy was to pop up from time to time during Tom’s career through no fault of his at all. When Edinburgh Racing Club first appeared on the scene, organised by Alan Robson it was immediately joined by several really top class runners, in the main from the Edinburgh clubs to start with and they were given immediate clearance under the existing rules to race for the club. They cleared up wherever they competed but the other clubs objected to what they saw as a club with no youth policy, no women’s section and no development policy other than recruiting senior men athletes from them. Alan Robson who set up the club said that they were just trying to have a club that could compete on equal terms with the best in Britain as the other Scottish clubs were not doing so. Nowhere was their dominance so obvious in Scotland as in the Edinburgh to Glasgow Relay where they were unbeatable for their entire existence. Tom had competed in the race for ESH in 1986 (winning bronze), 1988 (silver) and 1989 when the team was sixth. Thereafter between 1991 and 2002 Tom ran in ten E-G’s and won ten gold medals running the fastest time on his stage every year bar one when he was second fastest. It was the same story in all the other Scottish winter team races. For instance after gaining a gold and a silver with ESH in the Scottish Six Stage Road Relays, it was another four with Racing Club and there were seven golds in the four man Cross-Country Relay Championships. This would have been a notable career for most distance runners but it is as a steeplechaser that Tom Hanlon is best known and it is the track career that must take the rest of this profile. He started 1988 by winning the SAAA Indoor Championships running what Doug Gillon called ‘an astute race’ and then won the 1500m in in the Scottish Select v Midland Counties match in 3:44.2. In the ESH Club Profile in ‘Scotland’s Runner, Doug referred to Hanlon’s Steeplechase in Duisburg last year of 8:27.60. In the 1988 Olympic Trials he was sixth in the Final of the event in 8:41.99 and not picked for the Games. He had of course won the SAAA 1500m championship for the second time in 3:47.3 – it was a very close run thing with Geoff Turnbull of Valli Harriers second in 8:47.79, Adrian Callan third in 3:47.88 and Alistair Curries fourth in 3:47.89. The information in the next section is taken largely from Alan Campbell’s excellent article in the now-defunct ‘Scotland’s Runner magazine of August 1988 and outlines the start of his career. Born in West Germany, Hanlon lived in Northern Ireland, Hong Kong, Malaysia, Singapore and Yorkshire because his father was in the Royal Signals regiment. This all took place before he was 12 years old when the family settled in Edinburgh. He was the youngest of six children, four boys and two girls, and joined Edinburgh Southern Harriers soon after arrival in the city. Tom earned eight O grades and three Highers (English, History and Biology) while he was winning Scottish Schoolboys titles at the 200m steeplechase. He was coached by Bob Steele of ESH at this point – Bob was an experienced runner and coach who had moved to Edinburgh from the Vale of Leven in connection with his work for British Gas. He took what is now called a ‘gap year’ on leaving school but kept working on his athletics and was fourth in the World Junior Championship 3000m steeplechase in East Junior, winning in the process his first GB vest. Competing in the SAAA Senior championships he was second and broke nine minutes for the first time. Campbell then asks, “By one of these strange coincidences – or is it just a small world? 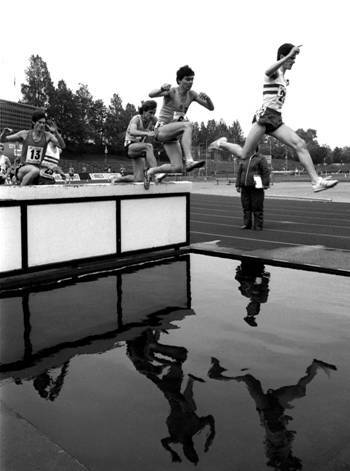 – Hanlon had been attracted to the steeplechase while watching on television the 1978 European Championships. There was a big pileup at one of the barriers and”, recalls Hanlon, “it was like one of those ‘what happened next?’ questions.” The drama inspired the youngster to set up his own steeplechase course in the back garden with clothes poles and other convenient hurdles! A coincidence because in that race was Dennis Coates, the steeplechaser who had set a British record of 8:18.95 in the semi-finals of the Montreal Olympics in 1976 – a mark which remained for six years. And in the autumn of 1985 it was to Dennis Coates’ old coach, Gordon Surtees, that Hanlon turned for tutelage. Surtees was aware of Hanlon through his involvement as national junior middle distance events coach and was just taking up his job as senior steeplechase coach when he was approached by the Edinburgh athlete. Like John Anderson and his Scottish athletes, Surtees and Hanlon have a long distance relationship, communicating regularly between Cleveland and Edinburgh.” And Gordon Surtees is the coach that assisted Hanlon to all his major triumphs. Surtees had come into athletics following a career as a footballer and, after an unenjoyable spell as an administrator, became a coach. He had been coaching successfully for several years when approached by Hanlon and when asked by Campbell what his secret was he replied: “I try to lead by example. I haven’t missed a day’s training for six and a half years and with my work and coaching commitments that means getting up at 5:30 every morning and doing my run then. I keep myself fit and have very strong principles.” His attitude to the 3000m steeplechase was that the higher up you get, the more important technique becomes. In a time of 8:30 he reckoned that 30 seconds is technique so the obvious thing was to work hard on the 8 minutes running. How did he rate Hanlon alongside Coates? “I think Tom will beat Dennis’s British record out of sight,” Surtees predicts. “We’re working Tom a little differently because he is so much faster and technically advanced than Dennis, while in terms of mobility he’s in a class of his own.” It was the speed and technique that marked Tom out as a steeplechaser with the ability to go all the way. His 1500m best of 3:38.5 set in Dijon, France, in June ranked him third British athlete at the distance up to the beginning of July. “If he’s going to be a world class steeplechaser he’s got to have a good mile or metric mile under his belt. He’s got a good bit to come yet in that direction”, Surtees says. Later after returning home, Hanlon said “I should have had Eddie Wedderburn on Friday but I let my concentration slip and had a bad last waterjump and barrier. I held off the pace at the start because I was feeling dead beforehand and knew the race was going to be fast. At Nice I did the same sort of thing. In the end I ran out of legs because of the race on Friday otherwise a time of 8:17 was there.” Rowlands, Wedderburn and Reitz had all run sub 8:20 in 1988 with the latter having run 8:12.11. The plan however was to work on quality training rather than quantity and the specific targets were Commonwealth and European Games in 1990. “I won’t commit myself to any question on the Olympics, ” said Surtees,” If he qualifies from the AAA’s trials it’s a bonus, and if he goes to Seoul I would expect him to have a go in any case – Tom is prepared to take on anybody in the world on and to run from the front if he has to.” Hanlon was at that time working at Marr Associates and his Arts Director was fellow ESH member Jim Devine (a 1:52 800m runner) who would accompany him on his lunchtime run. His training at the time was said to be: Monday: 6 miles steady; Tuesday: 10 x 400m in about 60s with 60s recoveries and they would both be reduced as the season went on; Wednesday: 5 miles steady; Thursday: 40 minutes fartlek; Friday: 100m, 800m, 600m, 200m with 400m jog recovery, Saturday: 40 minute run; Sunday: One hour (10 – 12 miles) It also pointed put that Tom is religious about performing mobility and stretching exercises which he regarded as essential for the steeplechase, in the mornings and evenings. The above is a typical weekly schedule in the summer and his favourite training area was said to be the wooded Corstorphine Hill. At the end of 1988 he topped the 1500m rankings with 3:38.39 and the steeplechase with 8:20.73. His best times in 1988 can be summarised in the following table. At the very start of 1989 in his Commonwealth Games preview in ‘Scotland’s Runner’, Doug Gillon when speaking of the qualifying times said: “To my surprise, some of the guidelines even err on the side of being generous to the athlete. Tom Hanlon falls inside the ‘A’ guidelines of 3:40 for the 1500m, the time that the selectors envisage as seeing an athlete well placed in the final. Hanlon, of course, after the disappointment of failing to qualify for the steeplechase in Seoul despite earlier in the season having set two Scottish records in a weekend, has had his appetite sharpened for his main event. But on the evidence of Seoul – two Kenyans and an Englishman inside 8:08 – the steeplechase A guideline of 8:38 does not hint at the promise of a medal.” The 1988/’89 season started with a win in the East District Indoors Championship 3000m in Kelvin Hall in 8:05.87 but in the SAAA Indoor Championship he could only finish second to Irishman Mark Kirk after missing five weeks with viral problems. He was nevertheless selected for the European Indoors in Stuttgart on 12th February where he clocked 7:52.56. True to form when it came to the UK Championships and Trials he was involved in some controversy not of his own making. He had entered the 5000m as had many others – too many others to have them all run in the same race. 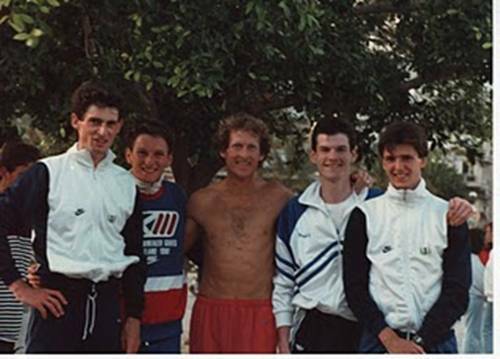 Tom found himself in the A race along with the top men such as Steve Cram while the other Scots were in the B race. This really angered Ian Hamer in particular: he claimed rightly that Tom Hanlon had never beaten him in a 5000m race so why had he been in the A race? Tom ran an excellent 5000m and was timed at 13:39.95 which was inside the standards for selection for the Auckland Games. Hamer won the B race in a slightly slower time and finished running up the home straight gesticulating at the selectors in the stands and shouting abuse at the top of his voice. Again controversy, but none of it down to Tom, as Ian himself made clear. On 11th June in a GB v Hungary v International Select at Portsmouth Tom was second in the steeplechase in 8:35.77 behind Seoul runner-up Peter Koech but ahead of the reigning Olympic Champion Julius Kariuki. In the Europa Cup, he was fourth in the steeplechase in 8:35.81. He had by now qualified for the Auckland Commonwealth Games in two events – the 5000m and the steeplechase. He won his third SAAA 1500m title in 3:42.42 from Geoff Turnbull (3:42.69) after a slow procession through 1200 metres. ‘Scotland’s Runner’ ran the headline “Hanlon notches another record before heading for Barcelona” and the article read “Tom Hanlon has continued to excel towards the end o the season with a record breaking run in Koblenz. The Edinburgh athlete took 3 seconds off his 3000m steeplechase record with a time of 8:16.52 at the West German international meeting. He said of his performance: “I wanted to get a fast time because of the flak I had been getting because of my World Cup selection.” This is the second time Hanlon has bettered his record this season and the sixth time in total. His time puts him fifth in the Commonwealth behind three Kenyans and Graham Fell.” The 1989 Scottish Rankings had him top in both 5000m and 3000m steeplechase, with the steeplechase time being the fastest in Britain for the year. To man in the British rankings would be held by Tom Hanlon in 1989, 1992, 1993, 1994 and 1995! 1990 was a big year with two international Games taking place – the Commonwealth Games in Auckland, New Zealand at the start of the year and the European Championships in Split, Yugoslovakia at the end of August/start of September. There was a lot of talk in the newspapers and athletics magazine before the team left about the small size of the team and the cost of the exercise. Tom was asked to reply to a short (six questions) questionnaire for the January issue of ‘Scotland’s Runner’ and he said that he would run in the steeplechase and “possibly also in the 1500m”. His stated aim was to take on the Kenyans, gain a good position and personal best time. His plans for after the Games were to take a break and try for the Europeans. He was quoted extensively by Doug Gillon in the second edition of the magazine for 1990 on the subject of money saying that it was a popular misconception that athletes near the top had a lot of money. He had competed in several major Games and meetings and not been paid a penny. In fact he had given up his job three or four weeks before the Auckland trip because he felt it was not fair to have four or five weeks in NZ at his employers expense – the Games were costing him about £10000 lost money in total. In the Games in Auckland, for whatever reason – none of the sources consulted said anything – he ran 8:45.76 for twelfth place. In May he went to the annual BMC fixture in Wythenshawe, Manchester and was timed at 1:49.5 for 800m a week after winning a 5100m in 3:45.76 in Edinburgh. On 10th June at Antony in France he was fourth in a 3000 metres in 7:53.41. He won the SAAA 1500m for a fourth consecutive time using his sprint finish yet again to win in 3:47.69 with one of his heroes, Steve Ovett, back in sixth place. On 10th August he competed in a Grand Prix in Belgium where he ran 8:16.31 and a week later in a flat 3000m in Gateshead he 8:01.77. He was clearly in good shape for the Europeans. In Split he ran much better than in Auckland and was second in his heat in 8:21.26 and only slightly slower in the Final where his time of 8:21.73 was only good enough for sixth place of the six finalists – the race was won by Olympic champion Kariuki whom he had beaten a year earlier. He finished the summer with a 2000m steeplechase at Sheffield in the McVitie meeting and ran 5:22.96 for second. During the season he had won the AAA’s 3000m championship in 8:02.11. His best times were 3:39.21 at Crystal Palace in July and 3:41.06 at Tonsberg in Norway for the 1500m, 7:56.82 at Belfast in June for the 3000m, and 8:12.58 (Monte Carlo in August), 8:16.34 (Lausanne in July), 8:17.43 (Zurich in August), and 8:18.02 in Tokyo at the end of August for the steeplechase. 1992 was all about the Olympics Games in Barcelona in August and his season was particularly active in June and July with an interesting mix of races. On 11th June he ran in a 2000m steeplechase at Caserta in Italy where he was second in 5:21.77 and a week later he won a 3000m steeplechase in an international against Kenya at home in Edinburgh. Then there were two very good performances at the AAA’s Championships in Birmingham where on the 27th June he ran 3:40.77 in the heats of the 1500m and then in the Final the following day he was second in 3:38.08. On 4th July he went to Bislett in Oslo for a 3000m steeplechase and ran a 8:13.65 followed by Crystal Palace on the 10th for a third place in the TSB Invitation meeting 3000m flat race where he was third in 7:51.31. In Nice on the 15th it was another steeplechase where he was sixth in 8:14.73. Preparations complete he headed with confidence to the Olympic Games in Spain. He had been seventh in the world the previous year, Scotland’s highest ranked male athlete, and had run faster at every distance in 1992 than that year. Given the strength of the Africans, the Kenyans in particular, he had a difficult task but he started his campaign well with a second place in the third heat in the first round in 8:27.46. Fifth in the semi-final in 8:26.91 meant that he was the only Briton out of three to qualify for the final eight. The second round was faster than the first round and the final, as expected a faster race, was faster yet again for Tom. he was sixth behind three Kenyans, an Italian and a German in 8:18.14. Every round quicker than the one before, the only Brit in the final and a good tactical race: who could have asked for more? After such good Games, what could we expect in 1993? In 1996 he topped the rankings again with 8:06.09 indoors at Birmingham in February to top the 3000 metres and was second in the steeplechase rankings with 9:00.03 at Birmingham where he failed to qualify for the final of the AAA’s Championship. The writer in the Yearbook for 1997 looking back at 1996 was scathing in his attack on the SAAA’s. “Injury-hit Scottish record holder Tom Hanlon had only one race all summer, finishing a dismal 12th in his heat at the AAA’s and the antagonism between this talented athlete and the Scottish athletic authorities that prevented him from realising his enormous talent on the track is one of the most regretful events of the past decade. So much has been lost in middle distance and steeplechase performances because the Scottish authorities did not arrange a rapprochement with Hanlon and allow a full blossoming of his talents for Scotland in International competition.” And of course, he was right. I knew no one who thought that Hanlon had been well treated by the authorities – he had been quite forthright in his criticisms of the team management at Auckland but everyone had moved on and the team management had changed almost entirely so at least an attempt could have been, should have been made to bring both sides together. AAA 3000m steeplechase champion 1991. The total of Scottish titles would have been greater but for the fall-out with the SAAA after 1990. This was an absolutely outstanding record and it would be very interesting to look at his fastest steeplechase races, ie those up to and including 8:20. There are 13 in all – Monte Carlo seems to be a favourite venue – three of the times were set there.